Tension prevailed at Undi MRO Office on Friday. Candidates of TDP and YSR Congress reached the MRO Office at the same time to file their nominations. Members of the two groups raised slogans against each other. 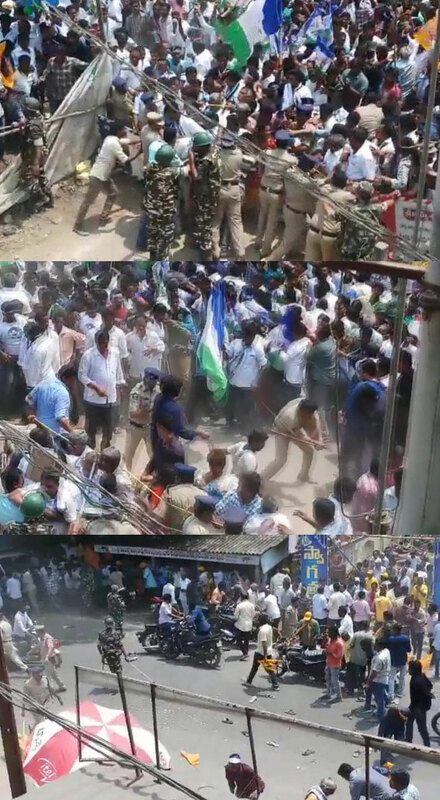 Police resorted to lathi-charge to bring the situation under control. On the other hand, The situation is no different at Gopalapuram MRO Office. While YCP Candidate Talari Venkat Rao was filing his nomination, TDP Candidate Muppidi Venkateswara Rao barged into the MRO Office. Few minutes before this incident, Returning Officer Karuna Kumari asked YCP Candidate to wait for sometime as Independent Candidate is filing his nomination when he arrived. No such objection was raised when TDP Candidate entered even before the completion of YCP Candidates nomination. Tension prevailed in MRO Office due to this development.